5 times a day a I get fund raising email from the DCCC. I tried to unsubscribe without success. 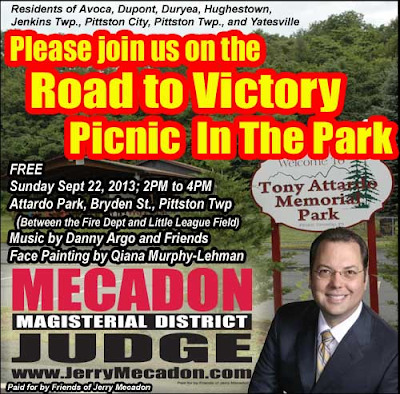 Luzerne County Democratic Committee Fall Picnic, Sunday September 29th noon till 3pm at the Catholic War Vets Grove in Ashley. This is a free event. We hope to see you there! Most endorsements are good for a press release and not much else unless they bring in money or boots on the ground. 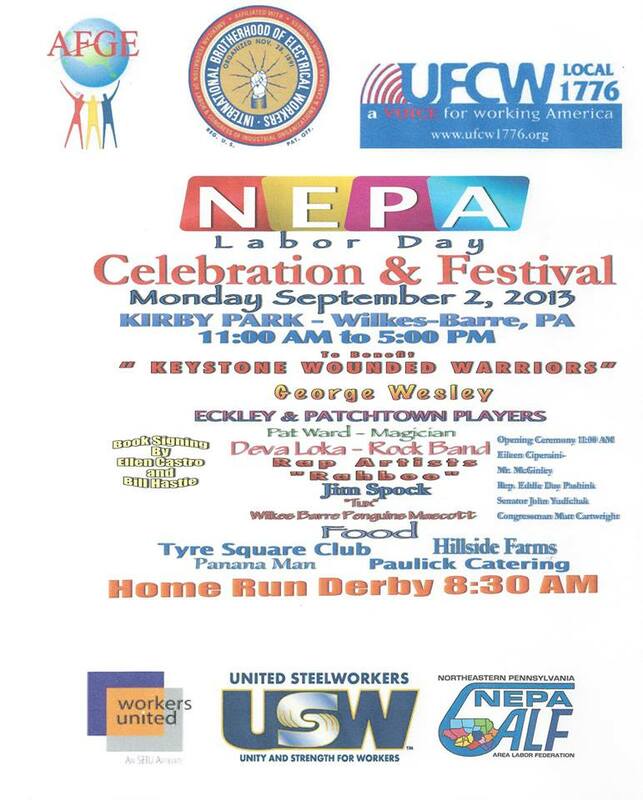 That's why union endorsements are so important in the PA Dem primary. Harisburg City Councillor Brad Koplinski has few dozen friends. Today, an additional 86 elected and Democratic Party officials throughout Pennsylvania, led by former Pennsylvania Treasurer and Auditor General Barbara Hafer and former U.S. Congressman Joe Hoeffel endorsed Harrisburg City Councilman Brad Koplinski’s campaign for Lieutenant Governor. The list of Democratic Party officials endorsing Koplinski now includes 25 Democratic County Chairs, 53 additional members of Democratic State Committee, 20 Countywide Elected Officials, 30 Mayors and dozens of municipal and former elected officials. Play by play from the State Democratic Committee meeting. PoliticsPA has rundown of what Governor candidates are doing to woo the faithful at this weekends get together. At the dessert event, candidates for the 13th and for Lt Gov were trying to give speeches, but the acoustics were terrible and everyone was milling around and talking. It was a waste of time for the candidates, as no one but their own staffers paid the slightest attention. They did better just working the room one on one. I finally got to meet Tom Wolf. Seemed like a nice guy. I didn’t even bother with the Schwartz staffers who were wearing candidate t-shirts over regular shirts, while mostly everyone else was dressed for success, and just had a few buttons or stickers. Except for the head fundraiser, the staff just seems like amateur hour and like they showed up at the wrong event by accident. McGinty seems very nice. If she is able to raise enough money, I think she will do well in first-person commercials explaining why she is running. When Kane ran, she explained herself and did well. Murphy had surrogates (the usual suspects) in his commercials. We know how that turned out. 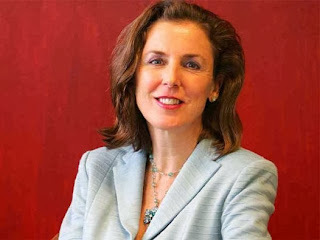 McGinty has a similar quality to Kane in the direct way she speaks. 2) that this was a way to filter money to his cronies by having them pretend they were running a Gov campaign. If anyone has a better theory, I’d like to hear it, because we are all pretty stumped about what he is really up to. Of course, it’s possible he’s actually dumb enough to think he has a chance, but I doubt it because he does have opposable thumbs and can walk upright. So, it must be something else. I saw Rob McCord. He was laughing and enjoying himself. I’m guessing the Teamsters endorsement was part of it. People were commenting how Rob timed it just right for his announcement. I think those “McCord for Gov” stickers had been gathering dust for months. Rob is pretty popular with Delco and Montco crowd, so he was in his element. Oh, yeah, and it seems like a lot of people are following Politics PA, because they recognized my name from here. A very big Thank You to the staff of The Red Mill for the outstanding service they provided to the 8th semiannual Blogfest. Our glasses were always filled and the food was great. The bloggers and candidates filled up the place early and then the regular Friday night crowd rolled in. In 35+ years if politics I saw something tonight that only happens every once in a very while. A young lady not connected to any of us wandered into our scrum and started talking to the various candidates. She told me that she had never voted before but will this time because she liked a few of the candidates.She had plenty of candidates to choose from. Controller candidate Carolee Medico Olenginsk (R) was the first in the door and bought pizza for the crowd. The question I kept getting is "where is Walter?" Former Controller Walter Griffith was always one of the first to arrive and the last to leave at our last events. I can't say I'm shocked he skipped this one. Dem nominee for Controller Michelle Bednar arrived later and charmed the crowd. Most of the Luzerne County Council candidates attended. Eileen Sorokas (D) has been to everything and Rick is a lot of fun. The Accountability Ticket of Mike Giamber, Renee Taffera and Kick Heffron arrived together. Republican candidates Paul Defabo and Sue Rossi and Independent Rick Williams are all working hard to get votes and Blogfest was a natural stop. Bob Morgan represented Cong. Matt Cartwright who has made every Blogfest since he got into the public spotlight. Cong. Lou Barletta did not send a surrogate as he usually does. They are both stuck in Washington dealing with the latest manufactured crises. State Rep Mike Carroll knows his back yard but the Mayor didn't make it..
Phyllis Mundy was awol. I just might have to vote for Mike in the next election. Alex Milanes lost his last election and is shopping around for an opportunity to lose another. Bible Buck and Duke from Dallas made it an official event. Alex Kokura have run great campaigns that tell you about their experience but have not ripped into each other. Fellow bloggers Joe V, Michelle and Harold helped organize the event and long lost blogger Zen made it as did the Yonk. County GOP Vice-Chair Lynette Villano and 2032 Presidential hopeful John Lombardo had a good time. Former W. Pittston Mayor and the Governors local point man Bill Goldsworthy kept his consecutive string of appearances alive. Bloggers, politicians, and candidates for political office will gather together at The Red Mill, 340 S Main St Pittston, PA starting at 6PM on Friday, September 27th for the Fall 2013 edition of Blogfest. I get a lot of unsolicited emails from candidates but this is the first one from a PA Governor hopeful.That tells me she has a really good campaign staff that understands the value of digital media.In other words, she has a couple of geeks helping out. As a candidate for governor, I would like to share with you my ideas on how we can build a better Pennsylvania. I believe it’s time for a change. Under Governor Corbett, Pennsylvania is 46th in job growth. Education cuts have hurt our schools. College costs are soaring. Healthcare is too expensive. Environmental laws have been weakened, while the Governor’s polices have attacked women’s health and privacy. I grew up the ninth of 10 children to a hard-working Philadelphia police officer and a restaurant hostess. Worked my way through college and law school. Served as Chair of the White House Council on Environmental Quality under President Clinton and Vice President Gore. I was the first woman to head the Pennsylvania Department of Environmental Protection, where I helped attract clean energy companies to our state, a billion dollars in new investment, and helped create 3,000 jobs. As a business executive in the private sector, I have championed clean energy and clean water projects. I believe Pennsylvania should be a leading state, not a lagging one. With an unparalleled work force, abundant natural resources, and world class universities, Pennsylvania should be driving the renaissance of manufacturing in the United States. We should be leading in life sciences and biotechnology. Our farmers should be competing for new markets around the world. And, we should be creating clean energy jobs by developing Pennsylvania’s energy resources, while protecting our air and water. As the mother of three daughters, I know Pennsylvania is only as strong as its families. It’s time for a governor who puts families first by making sure every worker earns a fair wage, every child gets a quality education, every qualified child can afford college, and every family has access to quality health care. It will take all of us working together to make it happen. And it will take a new leader to get it all started. With more than 25 years experience as a government and business leader, who has created jobs and supported the development of new energy resources, while protecting our environment, I’m ready to get to work for all of Pennsylvania. and Twitter today. It’s an easy way for me to hear your ideas and for you to get campaign updates and more. Together, let’s build a brighter future for all Pennsylvanians. We in Luzerne County had the opportunity recently to observe our Commonwealth's Superior Court hearing on the merits of Jerry Sandusky's appeal for a new trial in the impressive Court Room 3, of our historical and most beautiful Court House in Pennsylvania. Also on the docket was Commonwealth vs. Veon. Mike Veon being a former state representative convicted in the so-called Bonusgate scandal. Veon, in this case, was accused and convicted of receiving public relations and political benefit at taxpayer's expense. The Commonwealth admits that there was no financial gain by Veon, only public relations and political gain in the relocation of his local office. The attorney for Veon argued that every public office holder in America can be convicted of receiving public relations and political gain at taxpayer expense. 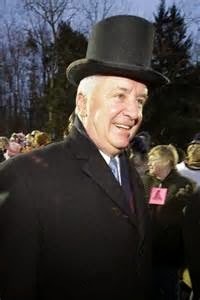 The shadow of one man looms large upon both of these cases, former Attorney General and current Governor, Tom Corbett.
. As attorney general, Corbett assigned one investigator to the Sandusky case, and 23 investigators to the Bonusgate investigation of all four caucuses, Democratic and Republican alike, of the State Legislature, which resulted in the conviction of Veon on charges he received non-financial gain at public expense. Corbett's promise to investigate all four caucuses was not kept. After the investigations of both Democratic caucuses, the investigations were stopped. The conviction of opposing party politicians was more important to Attorney General Corbett, than protecting the vulnerable children in the care of Sandusky. Question No. 1 in Pennsylvania is, why did Corbett give so little attention to the Sandusky case? Why Corbett gave so much attention to the Democratic caucuses is self evident. What was it, and why was it, that Corbett was so reluctant to investigate Sandusky? When the shoe finally dropped, how did Corbett react? Joe Paterno was sacrificed, the crazy NCAA sanctions against former Penn State football teams and current players, though there was never any sports cheating, and a stunned citizenship and shocked football fans in Pennsylvania. What is the impact of the gas drilling industry upon the policies of the Pennsylvania Republican Party and Corbett? What is the impact of the gas drilling industry contributions upon Penn State University's academic integrity? Was there a nod and a wink to not pursue the Sandusky case? Can there be another reason for inattention in the Sandusky case? Corbett has stated that he wants Pennsylvania to be more like Texas. It is not our grandfather's Pennsylvania anymore. Be careful what you ask for Corbett, you just may get it. You too, can be a victim of your own policies, even worse than Mike Veon. Karen Boback won't have a free ride in 2014. Wyoming County Auditor Laura Dickson announced her candidacy for Pennsylvania State Representative in the 117th District. “I decided to run based on the conversations I've had with people across the district and their dissatisfaction with our current representation in Harrisburg”. 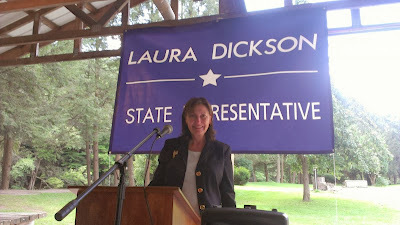 Dickson stated that her focus as state representative would be on promoting economic development through education, infrastructure rehabilitation, and development of new industries. “If we can coordinate our education system with the needs of potential employers, we can create hundreds, if not thousands, of new jobs in this district. We need a representative that will work every day to achieve that goal”. Laura Dickson has served on the Executive Board of the Pennsylvania State Association Of County Auditors since 2012. She recently worked as a divisional vice president at NCS, an institutional pharmacy company. While at NCS, she owned and operated her own fitness center business. She has served as the chairperson of Youth and Ministry and as chairperson of Special Programs and Events at East Lemon United Methodist Church where she has been a member since 2000. Additionally, she volunteers at the Seven Loaves Soup Kitchen, Tyler Hospital and the Wyoming County Kiwanis. She met her husband Jim while attending Keystone College. They have been married for 34 years and have one daughter, Sharon. State Representative Eddie Day Pashinski (D) wants to go back to Harrisburg for another term and over 100 of his friends gathered at Genetti's in Wilkes-Barre to support him on Sunday for brunch. Exeter Mayor Cassandra Coleman-Corcoran organized the event and PA Governor hopeful Tom Wolf greeted people at the door. W-B council member Maureen Lavelle showed her support and West Wyoming's Eileen Cipriani represented Phyllis Mundy who is plunging in the rankings. Only two 2013 candidates were in the crowd. County Council Democratic nominee Eileen Sorokas and Republican Controller replacement candidate Carolee Medico- Olenginski. problems. Luzerne County Democratic chair Bob Boyer was late to the party. Eddie Day gave what can only be described as a populist speech. He ripped into Governor Tom Corbett for his attempts to privatize all sorts of government function including education, liquor stores and the lottery. He described the voter ID law as cheating as it would disenfranchise 700,000 people.He reminded the audience that all elections are big elections as the school director and city councilor affect you life as much as a President. He reminded us that the common man can stand up to the billionaires just by casting a vote. So far I haven't heard of anyone planning to run against him. I hope a Republican candidate emerges soon. We should always have a choice in an election. Join us for a party for Rick Williams' re-election campaign Rick Williams for Luzerne County Council 2013. He's running as an Independent. Campaign Party at River Street Jazz Cafe - 667 North River St. - Wilkes-Barre, PA. No ticket sales or charge to attend. September 26th, 2013 - 5 PM till 7 PM. Less than two years ago, the new Luzerne County Home Rule government began to change the way Luzerne County governs itself. As I listen to residents throughout the county, I am often asked: "So what's really different, except now there are 11 council members instead of 3 commissioners?" When it comes to reforming the past practices of Luzerne County government, most people would like to see major changes happen quickly. From my perspective as the only Independent on the County Council, important changes are happening, though not as quickly as we would like. Changing government is not simple. But progress is being made. County Council is now implementing sound fiscal and budget practices that have put us on a path to pay down our debt and budget our money wisely. We are modernizing, improving efficiencies and increasing transparency in county government. New systems are being put in place to improve services to citizens by raising performance expectations, while simultaneously treating county staff fairly and with respect. Many dedicated citizens, not previously included in past political processes, are now serving on boards, authorities and commissions. And the Council is considering long term policies to improve the health, safety and economic development of our county to make Luzerne County an even better place to live, work, and visit. I am running for a second term on Luzerne County Council to continue this work because I believe these changes are essential to achieving ethical, excellent and accountable county government….the level of service the people of Luzerne County expect and deserve. I hope citizens will consider the hard work that the Council has devoted to building a foundation for the future and will support me with a vote in the November 5th election. Started as an informal political mixer over three years ago it has expanded to become a major networking event for bloggers, blog readers, and those curious about blogging. Since its inception two years ago, Blogfest has been described as the best political event of the season. No speeches are allowed, and the rule is "agree to disagree, but don't be disagreeable." Many local and statewide candidates will be attending. All are welcome, and there is no charge for admission. My pal and fellow blogger LuLac seems to be high on the Katsock-Grinaway ticket. I don't know. I still can't forgive Christine Katsock's vote for Frank Pizella as SB President after he was indicted for corruption. 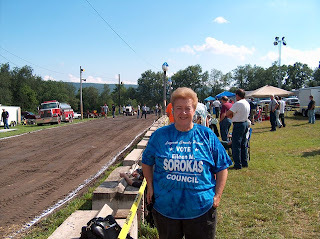 Eileen Sorokas had a nice turnout for her kickoff rally in her quest to win a seat on the Luzerne County Council at the Polish Club in beautiful downtown Hudson yesterday. When I walked in the door I thought I was in the wrong place as the first person I spotted was Luzerne County GOP Vice-Chair Lynette Villano. It was then explained that Eileen generously invited all county candidates regardless of party. She's a class act. The other 4 Democratic Council nominees showed up. Incumbent Linda Houck and the Accountability Ticket of Michael Giamber, Richard (Kick Heffron) and Renee Zita Ciaruffoli Taffera. They were joined by Republican candidates Kathy Dobash and Paul DeFabo. Both Controller candidates worked the crowd. Michelle Bednar (D) has already knocked off a big name in the Primary (Urban) and is now facing another one Carolee Medico-Olenginski (R). Councilor Ed Brominski and LC Chair Tim McGinley greeted the crowd. Eileen M. Sorokas, candidate for Luzerne County Municipal Council, will begin her fall campaign with a Kick Off Rally on Friday September 13, 2013. The free Rally will be held at the Polish American Club, 97 Martin Street Hudson(Plains) Pa. from 5 P.M. to 7 P.M. Food and Refreshments will be served. The general election is November 5th, 2013. Please Vote. “Earlier this evening I received a classified briefing on the facts of the situation in Syria. I learned about the chemical weapons attack and the possibilities of actions going forward. After reviewing and considering all of the facts, I cannot in good conscience vote in favor of an American military attack in Syria. “I have too many concerns that have not been addressed. I do not believe the necessity of American involvement has been demonstrated, nor do I believe that an adequate plan has been offered. For Congress to give approval to a military action, I believe we should see a compelling argument that our national security interests are immediately at stake, or that a failure to attack would cause us harm in the near future. I find neither to be the case. “Further, my many questions about the other aspects of a strike have yet to be answered. Al Qaeda appears to be intertwined with the rebel forces, which begs questions about what would happen after a military action. Similarly, our traditional allies are not firmly with us, and there are open threats of retaliation against Israel for any strike against Syria. Further, we don’t know what Russia and Iran might do in reaction. All of this means that it is unclear what actions against our own country or our allies might be taken in response to any American military strikes. It could result in our being drawn into a regional war. “There is also a late development involving a Russian proposal for Syria turning its chemical weapons stockpile over to international monitors. That is clearly a situation that warrants attention. My questions are, do we trust Assad, and into whose hands might the weapons fall? “Over the past weeks, I have heard from thousands of my constituents and they have been very adamant about their views on this question. With very, very few exceptions, they are against military involvement in Syria. I take their views seriously into account. The Kirby just added three great acts to the schedule. Alice covering Gaga with different lyrics is a great thing. "You may be crass, you may be dumb...but hell with that, are you having fun?" he sang to loud cheers from the crowd. "They killed me once. They killed me twice. They hung me high, but that's the price. Of fame and fear and fortune too, I'm standing here at Bonaroo!" Cal the SPCA. The Society to Prevent Clean Animals that is. Actually Quincy is the easiest dog to give a bath. The last 2 acted like they were going to be murdered. I'll be joining my brothers and sisters tomorrow. I'm sure many Democratic politicians will make an appearance.